Bayer Advanced is the 6th unit, the second float in the Rose Parade. Bayer Advanced™ is one of the largest lawn and garden brands and creator of some of the most effective rose care products for consumers. They are going for their eighth consecutive trophy in the 119th Pasadena Tournament of Roses® Parade on January 1, 2008. The theme for the parade is Passport to World Celebrations. 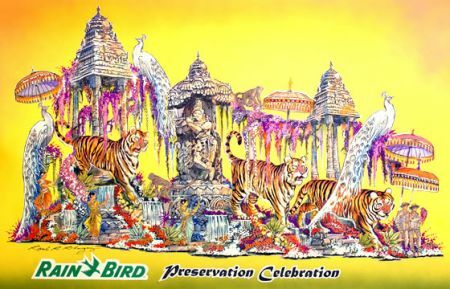 The theme for the Bayer Advanced float is Salute to the Rose Parade, since the Rose Parade is one of the biggest celebrations in the world. The Bayer Advanced Salute to the Rose Parade float will feature a 20-foot-tall sculpted rose that blooms and releases fireworks into the air, as well as a dozen former Rose Parade Queens. The 55-foot-long float will also feature thousands of roses including those named after Rose Parade Grand Marshals such as Mary Pickford (1933), Shirley Temple (1939), Charlie McCarthy (1940), President Herbert Hoover (1945), President Dwight D. Eisenhower (1964), Bob Hope (1969), Pele (1987), Reverend Billy Graham (1971), Kate Smith (1976), and Angela Lansbury (1993). The float will debut two of the 2008 All-America Rose Selections winners for best roses of the new year — Dream Come True and Mardis Gras. — A 20-foot-tall sculpted rose that blooms with a pyrotechnic show. Streamer cannons. — Float riders: A dozen former Rose Parade Queens. — More than 16,000 roses, including those named after former Rose Parade Grand Marshals Mary Pickford (1933), Shirley Temple (1939), Charlie McCarthy (1940), President Herbert Hoover (1945), President Dwight D. Eisenhower (1964), Bob Hope (1969), Pele (1987), Reverend Billy Graham (1971), Kate Smith (1976), and Angela Lansbury (1993), are all scheduled to appear on the Bayer Advanced float. — A rose variety named after Christopher Columbus, who is credited with discovering the New World in 1492. — The world debut of the 2008 All-America Rose Selections(TM) winners for best roses of the New Year – Dream Come True and Mardi Gras. www.rose.org . — Onion seed, ground rice, parsley flakes, ground split pea, lettuce seed, poppy seed and sesame seed in honor of 2008 Rose Parade GrandnMarshal Chef Emeril Lagasse. — Float music: Dancing in the Street by Mick Jagger and David Bowie. — 55 feet long, 20 feet high and 18 feet wide. — Michelle Lofthouse of Phoenix Decorating www.phxdeco.com designed all of the Bayer Advanced award-winning Rose Parade floats. As part of the Bayer Advanced salute to the Rose Parade, Bayer Advanced is putting a rose in space. 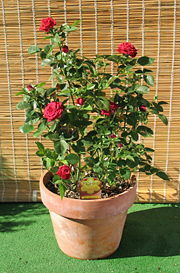 A rose named after the Tournament of Roses(R) will be on the January 10, 2008, mission of the NASA space shuttle Atlantis. http://www.nasa.gov/mission_pages/shuttle/main/index.html . The rose was grown in the Bayer Advanced-sponsored Wrigley Gardens at the Tournament of Roses Association headquarters in Pasadena. Bayer Advanced products are used to grow all the roses in the Wrigley Gardens. 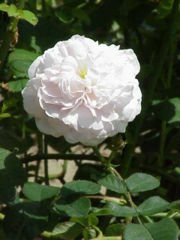 The Tournament of Roses rose, which was dried in preparation for the shuttle mission, will be one of the personal items taken into space on STS-122 by astronaut Rex Walheim on behalf of his brother Lance Walheim. Lance Walheim is the Bayer Advanced garden expert and selected many of the roses on the Bayer Advanced float. Technical problems delayed the December 6, 2007, launch of the shuttle Atlantis. 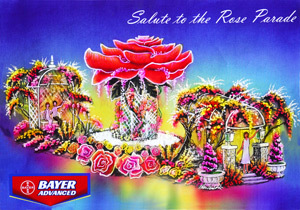 The rose was going to be featured on the 2008 Bayer Advanced float. It will now be featured on the 2009 Bayer Advanced float.